Is the 100th time the charm? Cavalcade of Risk celebrates its centesimal issue today – that’s a lot of risk coverage! Our host for this landmark issue is Russell Hutchinson of moneyblog – tip of the hat to him for a good issue. And kudos to Cavalcade founder and visionary, Hank Stern of InsureBlog. “Twelve other firms that operated under rules that exempted the failed company’s clients from drawing from an insolvency pool still do business in the state. And while they all now pay into that pool, 10 have claims predating the 2008 change in the law that required them to do so. Mad as a hatter – On the recent release of Tim Burton’s Alice in Wonderland, the CDC reminds us that the phrase “mad as a hatter” originated from on-the-job mercury poisoning. To shape felt hats, hat makers used a solution of mercuric nitrate and, as a result, often suffered from agitation, tremors, slurred speech and other neurological symptoms – thus, “mad as a hatter.” Hat manufacturers used mercury until 1941. Mercury is still used in many industries and the CDC article has some interesting statistics, as well as a page devoted to recommendations, reports, and other resources for preventing hazardous exposures to mercury on the job. Fatal Injury mapping – via Occupational Health & Safety, we learn that OSHA has introduced a new fatal injury mapping module, which “…allows users to create customized, color-coded maps of injury-related death rates throughout the United States. It defines injury-related deaths according to intent (e.g., unintentional, homicide, suicide) and mechanism of injury (e.g., motor-vehicle traffic, fall, fire or burn, poisoning, cut).” CDC’s Fatal Injury Mapping Module. Other data and statistics are also available from CDC’s WISQARSTM (Web-based Injury Statistics Query and Reporting System), an interactive database system that provides customized reports of injury-related data. NY crane deaths followup – Liz Borowski of The Pump Handle offers and update on the 2008 crane NY crane disasters. The owner of the city’s largest construction crane company is expected to be indicted for manslaughter in the death of two workers in one of the incidents. She also updates status on OSHA’s crane & derrick rule. In December we blogged the horrendous case of Carla Nash, a lovely woman who was mauled by a chimpanzee owned by Sandra Herold, a friend. The 200 pound chimp literally ripped her face apart. Nash, who lacks health insurance, has been hospitalized for over a year at the Cleveland Clinic. The attack destroyed her vision and rendered her face unrecognizable (and unviewable). Doctors have determined that she is not ready for a facial transplant. She has sued Herold for $50 million. Her medical bills will easily run to 7 figures; who will pay has yet to be determined.In our prior blog, we noted that Herold was trying to limit the exposure to her workers comp policy. A little lost in Nash’s tragedy is the fate of Frank Chiafari, the Stamford, Connecticut police officer who came to Nash’s aid. The raging, blood-covered chimp approached Chiafari’s cruiser, tore off the mirror, ripped open the door and tried to attack the policeman. Chiafari shot and killed the chimp. In the weeks and months following the incident, Chiafari suffered from post-traumatic stress disorder (PTSD); he experienced anxiety, flashbacks, mood swings and nightmares. He underwent counseling. (It’s not clear how much time, if any, he was away from work.) Chiafari’s workers comp claim was denied: under Connecticut law, public safety officers are eligible for PTSD benefits only when they shoot people – not animals. The good news is that Stamford has been covering Chiafari’s medical bills, although they did require him to switch to a therapist of the city’s choosing. The even better news is that Chiafari has literally been working his way through this work-related nightmare. He is still on the job. There is movement in the Connecticut legislature to amend the workers comp statute so that public safety officers are covered for PTSD resulting from the use of deadly force involving animals. As is so often the case, the law will be adjusted long after the incident that exposed the gap in coverage. Fortunately for officer Chiafari, the city, despite the comp denial, recognized the legitimacy of his claim and paid for the needed counseling. They did the right thing for an officer who did the right thing. Nothing will erase the horrible images from that fateful day last February. But life for Chiafari can go on in all its ordinary splendor – more than we can say, alas, for the ill-fated Carla Nash. “Exclusive Remedy” for Losing Your Face? 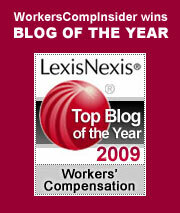 Usually employers try to prove that someone is not an employee, in order to avoid the workers comp liability. (Think “independent contractor.”) Today we examine a truly horrific case where the employer is desperate to establish compensability under workers comp, so that a grieviously injured employee can only collect comp benefits. By using the “exclusive remedy” provision of comp, the employer wants to avoid liability for pain and suffering. Some pain, some suffering! Sandra Herold runs a towing company out of her house in Stamford, Connecticut. The company had a mascot – a 200 pound chimpanzee named Travis, who lived with Herold. I do mean lived with her: according to reports, they shared wine at candle lit dinners and shared a bed as well (no further comment possible). Charla Nash occasionally worked for Herold, in an unspecified capacity. In February 2009, Herold called Nash and asked her to come by, as she was having trouble controlling Travis. As soon as Nash arrived, Travis attacked her, ripping off her face (literally). She lost her eyes, nose and mouth in the horrendous attack. (While images of her ravaged face are available on the internet, I do not recommend viewing them.) Police eventually were able to shoot the chimp. Herold’s first line of defense is establishing workers comp as the “exclusive remedy.” She claims that Nash is an employee and thus is prohibited from suing her “employer.” While it may be premature to judge this particular strategy, it seems highly unlikely that Herold will prevail. Even if she can show that Nash was on the payroll, it is clear that Nash was not working on the day of the attack; Herold had called her and asked her to come over to help with Travis. And even if it can be proven that Nash occasionally helped out with Travis, it is unlikely that her job description included the duties of an animal trainer (for which she is not qualified). Herold is banking on a judicial process that finds having your face ripped off by a 200 pound beast is simply part of the job, part of the “assumption of risk” we all accept simply by showing up for work. (If that were the case, how many of us would be willing to report to work?) Herold’s house-of-cards defense will collapse with the most humble of gestures: Nash revealing her destroyed face to a jury. Exclusive remedy is an important concept, one well worth preserving, but in this situation, it has no place. Herold must be held accountable for the actions of her late companion, Travis – anything less would be a travesty.